Editors: Bob Hargrave worked in agriculture in dryland parts of Kenya for 17 years. He is on loan from AIM to ECHO, where he heads the Technical Response Unit. The staff members that are part of this group are the ones who respond to your questions about problems you encounter as you help small farmers, and to your requests for trial packets of seeds. Areas of the world that are considered Arid and Semi-Arid Lands (ASAL) present a challenge for the farmer with limited resources. These areas are marginal at best for maize and beans, which are favored by many people. Where maize and beans are not an option, other grains and legumes must be produced to provide a balanced plant-based protein. Grains usually produced in ASAL areas are sorghum and the millets. One of the best options for a legume is the green gram or mung bean (Vigna radiata; Figure 3). I had more success under varying conditions with this legume than any other in several different ASAL areas of Kenya. 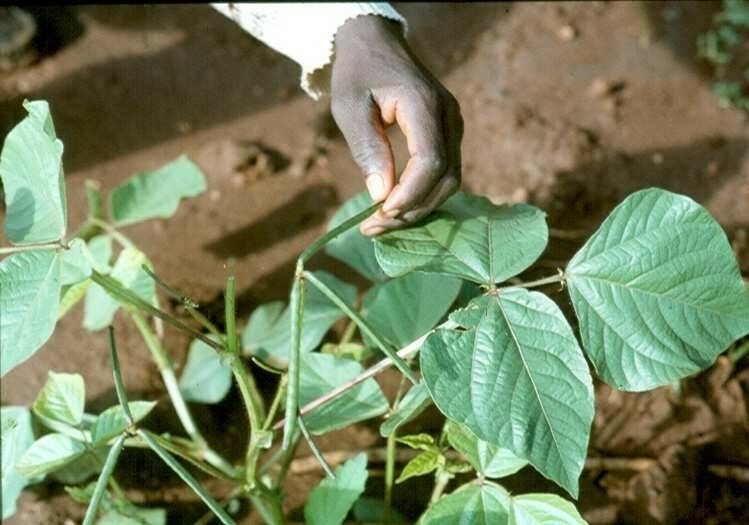 Green grams consistently suffered less damage from insects than cowpeas (Vigna unguiculata) and were more reliable than common beans (Phaseolus species) under unfavorable conditions. Green grams were already being cultivated and eaten when we arrived in Kenya. They have been a staple for several of the people groups in Kenya for a long time. The Kenya Agricultural Research Institute (KARI) had come up with an improved variety by 1985. Figure 3. Green gram plant and immature pods. Photo by Bob Hargrave. The term “bean sprout” is most commonly applied to sprouts made from green grams or mung beans. Anyone who has eaten the Chinese dish called chow mein will undoubtedly have eaten green gram sprouts. Green grams have been grown in China and used for bean sprouts for thousands of years. They are extensively cultivated in much of Asia and also in semi-arid areas of Africa. In India they are used to make moong dhal— dehulled and split green grams used for various dishes. Green grams grow on an annual bushy leguminous plant that grows to a height of 30 cm to 1 meter. Flowers are pale yellow and crowded in clusters of 10 to 25. Pods are green while filling, turning to black or brown when mature. The pods are 3 to 5 inches long and contain 10-15 seeds. Seeds are small, round or oblong, and usually green (Figure 4). Figure 4. Green gram. Photo by Bob Hargrave. Green grams are very nutritious for human consumption. They may be used as a fresh, shelled bean, a dry bean or sprouted. The dry beans are a good source of vitamins and minerals and contain around 20% protein. Around the world they are consumed directly and used in various dishes including curries, soups, breads, sweets, noodles, and solids. In the evening and twice a day until they are ready, rinse the seeds and return them to the dark, warm location. Once they start sprouting, the green seed coats will separate and may be removed while rinsing. The bean sprouts are ready to use when they have reached 4 to 8 cm in length and before the first leaves have fully developed. They are then ready for use in your favorite recipe or just about any combination of stir-fried vegetables.The sprouts may be kept refrigerated for several days. There are many varieties and land races of green grams around the world. The World Vegetable Center (also known as AVRDC) is the leading organization currently breeding new varieties and providing information about the production of green grams. If green grams are growing in your area, it is probably best to use the local variety. ECHO does have one unnamed variety of green gram in our seed bank and can provide a small packet for evaluation according to our seed distribution policy. Angela Boss grew some green gram in the Central African Republic and sent this report: “We have managed to get more than 9 kilograms off of a 20 x 7m plot of green gram beans, which people here are quite happy with…. [Plants] are upright and non-vining, and [seeds] only take 30 minutes to soften in water.” Angela commented that they started picking the beans after 2 months. Green grams grow best in warm climates at a temperature of 28 to 30°C (82-86°F). They usually mature in 60 to 90 days. The early maturing varieties can often produce before drought destroys many bean species. In areas with higher rainfall it is recommended to grow green grams on raised beds. Green grams will respond to fertilizer or manure application but will normally give satisfactory results if grown on relatively good soil. They can be inoculated by the common “cowpea” bacteria. Green grams are susceptible to the usual array of pests and diseases that attack other Vigna species. However, if grown during the correct season with good cultural practices, they should not need pesticides. Green grams mature continuously for several weeks and should be hand picked every few days for maximum production. 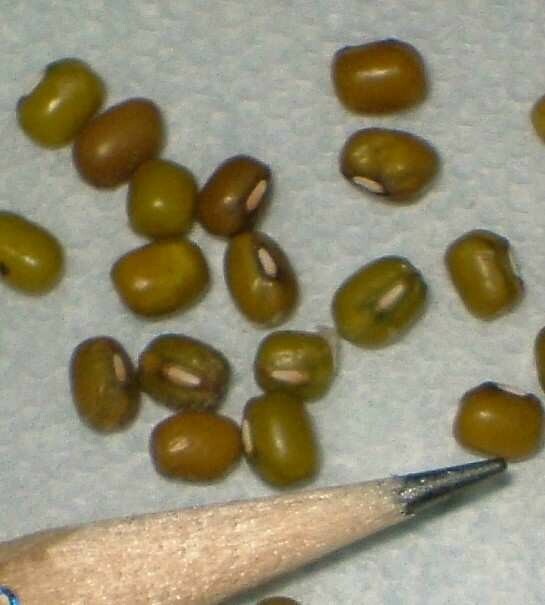 As with most legumes, the pods may be picked when they have changed color from green to brown, indicating that the grain filling period is complete. Dry the pods to the proper moisture content for storage (10% or less; generally when seeds are hard and dry).